After a pretty lame Saturday, I decided that I better do something productive with my Sunday. So I did. I ran 10.6km at Burnaby Lake with my good friends Liz and Di, and I went for a walk and did some shopping with my friend Sheralyn downtown, taking photos all along the way. I felt like I had been neglecting my camera lately, so I made a promise to myself take it with me more often when I go places. We saw this tree absolutely covered in ladybugs on the way back from our walk. Good thing I had my camera, eh? So, I had been debating on whether to go on this evening photowalk or not, and finally decided to stop thinking about it and just do it. I’m very glad that I did. There was a large turnout for it, more than I expected. We met on Granville Island, and there were 3 models there to shoot, which I also wasn’t totally expecting. I took some shots of one of the models, Barbara, in front of these lights boxes (after some coaxing from Scott) and this is probably my favourite one of the bunch. Meanwhile, the guys were all shooting using flash triggers, which I don’t have any experience with, but Jeremy loaned me his remote trigger and Peter helped me get the correct settings to get a good shot. He got me to shoot using manual settings, which I’ve never done; I always just shoot in either shutter priority or aperture priority, but this is what these photowalks are for, learning! Below you will see my beautiful subjects for my first “off-camera flash” experience. Afterwards, we walked around Granville Island a little more and John let me borrow his tripod for some shots. I really have to thank all of these guys. I was pretty intimidated at the beginning, but they sure made me feel welcome. It ended up being a total learning experience for me, and I look forward to more photowalks like this in the future. Here’s another one of my favourite photos from last night – John showing the models one of the shots on his camera. To view the rest of my photowalk set, click here. I’m glad you decided to come out to the photowalk…and that you got to try a bunch of new things! Yay! Thats so great Janis! Keep it up! Woohoo! Janis, the ladybug photo is AWEsome. Really like the lighting in the shot with Jeremy and Tyler too. Damn you’re good at this. Would love to get in on the next one of these you do Janice… can you give me the heads up when you go next? Rob, I just invited you to the Facebook group. There are some photowalks happening in November. You should definitely come. Whoa, awesome ladybug shot FTW. Also Team Canon is pretty cool too. 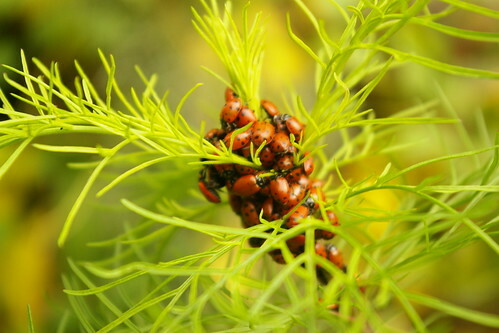 Great shot – the ladybirds!